The AmeriWater reverse osmosis system is not just another RO. Attractive cabinet style systems come equipped with optional on-board carbon and anti-scalant pre-treatment eliminating the need for additional pre-treatment. This system is extremely quiet, with a controller that offers many features, including an on-board disinfection cycle with the simple push of a button. A variety of models available based on your need for output (gallons per day) and quality. 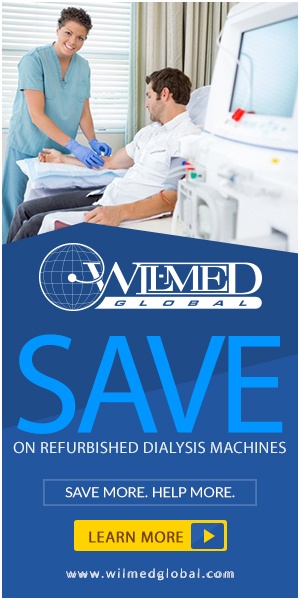 FDA and ISO licensed for use in dialysis. This feature-packed, user-friendly and easily-servicable R.O. unit is amazingly quiet (approximately 55 decibels). This makes the Medi-Port P.B. II a great choice for acute hemodialysis. The 700 Series dialysis reverse osmosis system provides increased water production capacity, standard monitoring controls, and a built-in caster system for easy relocation. These portable RO’s have a proven record of being dependable while producing consistent, high purity water quality. Pretreatment accessories can be added on making it a complete water system device. The Millenium is the leading portable reverse osmosis water treatment system for acute and home hemodialysis treatment in the U.S. It features a lightweight, space efficient design; quiet operation; digital readouts and alarms; full diagnostic capabilities; and user-friendly connection ports. Several carts and docking stations with various pretreatment options make this a truly compact and complete water solution on wheels.